Sri Lanka is world-famous for its high-quality tea production, known as "Ceylon Tea". Though almost all other official names were changed from "Ceylon" to "Sri Lanka", "Ceylon Tea" is still used as a trade name, with a long tradition. Visitors of Sri Lanka's scenic highlands should not miss to visit a tea plantation to study the tea plucking and production and to taste a cup of Ceylon tea in the land of its origin. Now there is another source of information for guests of our motherland, the "Ceylon Tea Museum" at Hantana near Kandy. It is established in a former tea factory. Some information provided by this museum can be read below, too. The origin of tea is shrouded in folklore and is as fascinating as the beverage itself. Tea was first discovered in China. During the reign of the Chinese emperor Shen Nong, according to legend. This emperor always insisted on boiling water for drinking purposes and one day a few leaves from a nearby camellia bush blew into the pot of water he was boiling, giving it an unusual colour and a delicious taste. The emperor was delighted with this new brew which he also found to be rejuvenating and so tea was born. The exact date when teaa was discovered is not known, but it is said to have been between 2737 and 2690 B.C. In the 8th century Lu Yu published “Ch’a Ching”, which was a sort of tea production manual. By then tea was a popular beverage and Yu’s work brought uniformity to how tea should be cultivated, manufactured and brewed. The botanical name for tea is “camellia sinensis”. From China, tea growing spread to Japan, India and Sri Lanka, then known as “Ceylon”. The tea first planted in this country originated from Assam, which was then part of India [and is an Indian state now]. Today, tea is grown in other parts of the world, including Africa. “Ceylon Tea”, as the tea from Sri Lanka is called, is renowned the world over, and greatly sought for its rich aroma and flavour. Tea came to Sri Lanka when the first tea bush was planted in 1867 by James Taylor, a young scotsman on Loolecondera Estate in Hewahata. At that time, coffee was grown on most plantations in the hill country. When the coffee trees were destroyed by a fungus, tea became an alternative crop to grow. Over a period of 5 years, James Taylor planted 10 acres of tea from Assam sees on Loolecondera Estate. It was a long process of trial and error. James consulted with people of experience: a North Indian planter named Mr. Noble who taught him how to pluck, wither and roll tea leaves, an old Asam planter, Mr. Baker, who taught him the finer points of pruning tea bushes. Taylor believed in “finer picking” which increased the selling price of tea as well as the selling price per acre. The first shipment of Ceylon tey comprising 23 pounds in two small packs was sent to the London Tea Auctions in 1872. The value of the shipment was 58 Rupees. James Taylor put his heart and soul into cultivating tea. He never married and only once. During the Forty years he spent in Sri Lanka, he took a holiday and spent it studying tea in Darjeeling. Taylor died of dysentery in Sri Lanka in 1892 at the age of 57. His pioneering contribution to this island’s tea industry is commemorated on a bronze tablet at the Ceylon Planters Association headquarters in Colombo. along with other pioneers of Sri Lanka’s plantation industries, George Bird and Henry Wickham, who helped build the country’s coffee and zubber industries respectively. Dimbula is, perhaps, the most famous name associated with Ceylon Tea. The plantations located at 3,500 to 5,500 feet above sea level, cover the western slopes of the district. The monsoon rains and the cold dry weather produce a range of teas, from full bodied to light and delicate. As Nuwara Eliya is unique, so is its tea. Recognized by tea connoisseurs, it has been said that Nuwara Eliya, at 6,240 feet above sea level, is to Ceylon tea what Champagne is to French wine. Brewed light it makes for a very smooth cup of tea that can also be iced for a refreshing difference. Grown at an elevation between 3,000 to 5,000 feet above sea level, on the eastern slopes of Sri Lanka’s central mountains, the Uva teas have a truly unique flavor. These teas are commonly used in many different blends but, with their different characteristics, they can also be enjoyed on their own. Sabaragamuwa agro-climatic region ranging from sea level to about 2,500 feet is also referred as low grown tea and typically known for their stylish leaf appearance and larger particle size. The blackness of the dry leaf is a distinctive feature, as are the deep red colour of the infused brew of its black tea and its smooth and full bodied liquors. 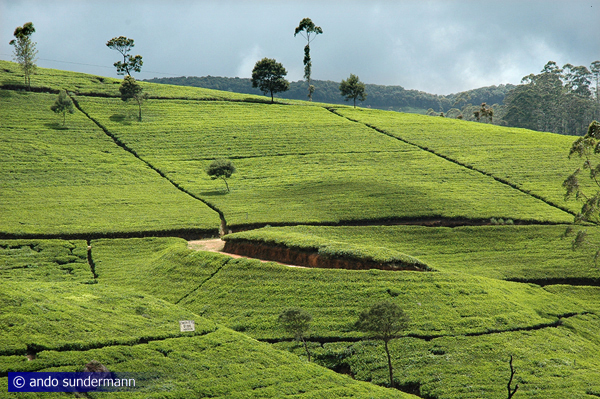 The southern part of Sri Lanka, though not traditionally known for its tea growing, does produce an exceptional tea. Grown from sea level to about 2,000 feet, the particular condition of the soil gives the leaves blackness and imparts in the brew a strong and distinctive taste. A perfect cup of those who like their tea thick and sweet, with or withous milk. In modern times, degenerative diseases such as heart disease, stroke, cancer and diabetes are on the increase. Such diseaes are said to be among the top ten causes of death after the age of 45. Increasingly, scientists and nutritionists are looking at the beneficial components of diets. Recent research studies carried out internationally and also at the Tea Research Institute of Sri Lanka show that regular consumption of both black and green tas can play a crucial role in reducing the risks of degenerative diseases, because of the powerful anti-oxidants contained in tea. 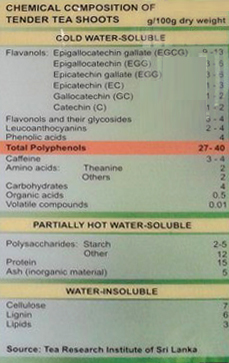 A typical brew of tea contains 0.35% tea solids in water. A group of chemical compounds known as polyphenols are a major component of 40% of the solids extracted into the brew. Polyphenols include catechins, theaflavins (TF), thearubigins (TR) and other flavonoids which act as anti-oxidants after consumption. Tea contains almost zero calores and although rich in potassium, its sodium content is low, making it a safe beverage as well as a beneficial one. In addition, it contains fluride which together with the polyphenols help to fight tooth decay. Polyphenols are found in most plants. However, tea is unique because it has a huge amount of polyphenols. Ceylon tea is grown in otimum conditions, accoring to stringent cultivation practices recommended by the Tea Research Institute of Sri Lanka. There is minimum use of pesticides. It is also ozone-friendly, as no chemicals that deplete the ozone layer are used. Scientific investigations indicate that tea polyphenols have cancer-fight properties. This has been seen in population studies comparing tea drinkers with those that do not consume tea. All cells in living organisms contain genetic material or DNA ((deoxyribonucleic acid) which controls all body functions, growth and cell reproduction. In the initiation of cancer, DNA is damaged or undergoes a mutation which alters the function of the cells it controls and transforms them into cancer cells. In most cases the altered cells die. In others, they rapidly grow and multiply, finally becoming cancerous tissue. Agents that damage DNA are called mutagens and those that cause cancer are carcinogens. All mutations do not progress to cancer, nut any agent that can damage DNA is a potential threat. Certain chemicals, radiation, smoke and viruses can act as carcinogens. Ultra violet (UV) radiation is a major cause of skin cancer. Smoking has for a long time been a well-established cause of human carcinogenesis. Tea polyphenols have been shown to directly react and neutralize chemical carcinogens, reducing the risk of cancer. The human body has enzyme systems in the liver which detoxify toxic and carcinogenic agents entering the body. Tea increases the activity of these enzymes. In the promotion and progression stages of cancer, cell to cell signaling promotes the multiplication of cancerous cells. Tea components interfere with cell to cell signaling and reduce the promotion and progression of cancer. In a person affected with cancer, small blood vessels provide blood to the cancerous tissue in a process called angiogenesis. Research shows that tea counters this process as it has anti-angiogenetic properties.